Hands down, my favorite thing about 2013 so far has been the birth of Sophia, my brother and sister-in-law’s first child, and my first niece. There’s something pretty spectacular about being an aunt (I know Rhiannon would agree), and something even cooler about the fact that Sophia was born the day before my birthday (Happy Early Birthday to me!) So when Bianca mentioned an idea she had for a photoshoot for Sophia about a month ago, I was thrilled, because I knew it’d be adorable. Little did I know that events would transpire that would put me in the role of photographer, but man, was it fun! 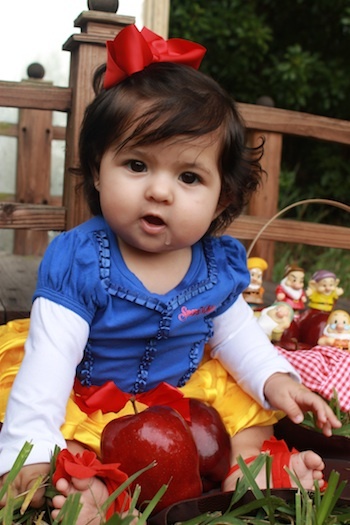 Because Halloween is right around the corner and we were dealing with a rainy forecast for the weekend, Bianca wanted to make sure we started out with her first Halloween costume (ever) – Snow White. With a borrowed bridge and mirror, a basket of apples, and the seven dwarves, we managed to stage a pretty magical outdoor retreat in just a few minutes. This was Sophia’s first time playing in the grass, and we definitely had our hands full trying to keep her attention. But she was a trooper, and gave me enough time to take about 100 photos or so before she’d had enough of outfit #1. 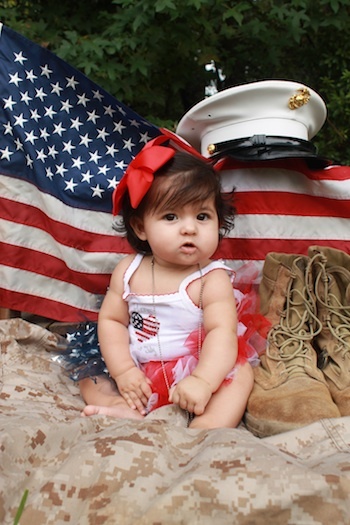 Because Sophia was born right after my brother deployed to Afghanistan, she hasn’t had a chance to meet her daddy face-to-face yet. When Bianca told me what she had in mind for outfit #2, it took everything I had not to tear up. (I’m a total marshmallow.) While Bianca got Sophia ready, Chris and I set up the backdrop for our “Welcome Home, Daddy” pictures. Equipped with Sean’s white barracks cover, combat boots (which he wore while in Iraq) and dog tags, as well as an American flag, confederate flag and camouflage, we were ready to add Sophia. 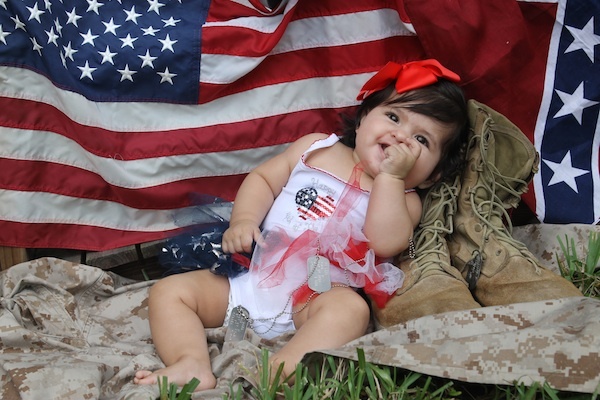 My brother is coming home from Afghanistan toward the end of October, and I can’t wait for to see his reaction when he meets his little girl for the first time. Sean’s dog tags and boots were a hit with the littlest princess (which made all of us smile), and she put up with Bianca and I rearranging her constantly quite well, although toward the end of this round, she let us know in no uncertain terms that she was close to her limit. Outfit #3 proved to be the last straw for our little darling, and she had a mini meltdown before letting me take any pictures. 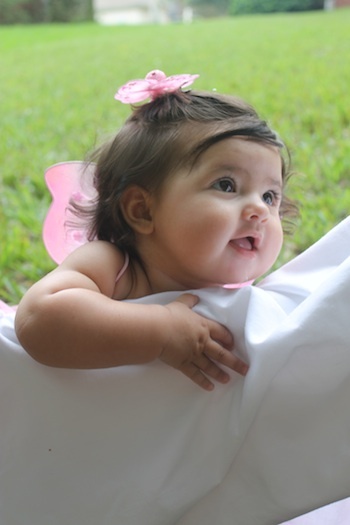 She still looked ridiculously adorable dressed up in the butterfly fairy outfit Bianca made for her, but she was tired and hungry and ready for a break. I’m still going through all the photos I took yesterday, and haven’t had a chance to add any filters or make any edits, but as a proud auntie, I couldn’t help but share her cuteness as soon as possible. 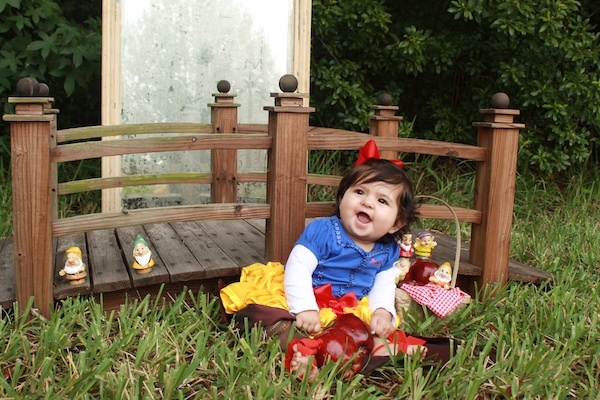 If this little Facebook fad ends, you have a future in baby photography.